with style and substance: february recipe and a christmas shoot. february recipe and a christmas shoot. I have been working on a Christmas photo shoot for Bo Bedre, a Norwegian magazine that focuses on architecturally detailed homes and furniture with a modern twist. I decided to make one of my favourite cookie recipes for the kitchen photos. so needless to say, I was up late baking the second batch! In a large bowl with an electric mixer, combine 40 g of confectioners’ sugar and butter and beat until fluffy. Add lemon zest and lemon juice and vanilla bean and mix until fluffy again. In a separate bowl, sift together flour, cornstarch and salt. Add this to the butter mixture and mix on low speed until the ingredients are just combined. Roll dough into two logs and wrap in baking paper. Refrigerate logs until firm about, one hour. Preheat oven to 180 degrees. Unwrap logs and slice into 6 mm thick rounds. Place on baking sheets lined with baking paper. Bake until barely golden, 12-15 minutes. 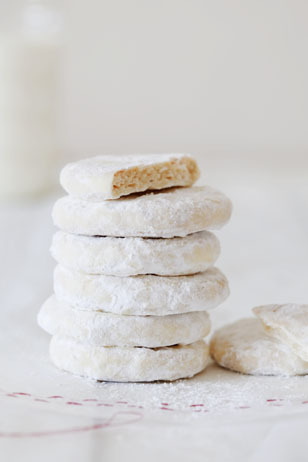 While cookies are still warm, place in a re-sealable bag with remaining confectioners’ sugar and toss to coat. Beautiful styling Tara!! What a dream job you have. 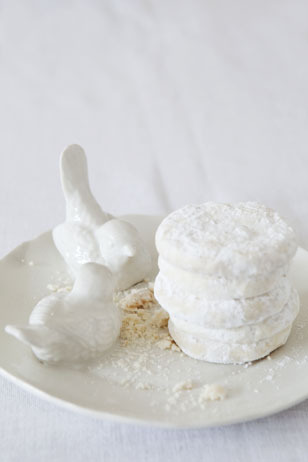 For next, next Christmas you should make Russian Tea Cakes. I love how they look like little snowballs, absolutely perfect for the holidays'. Thanks so much for the great tip and the nice comment!